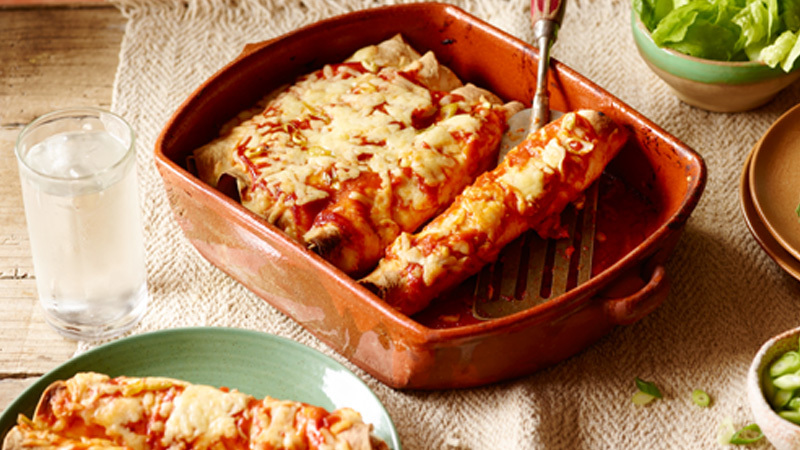 Try these easy, cheesy ground beef enchiladas, complete with sassy sauce and mild chillies. 1. Preheat the oven to 190°C, 170°C fan, gas 5. Grease a 33 x 23 cm (roughly 2.5 litre) baking dish with the oil. 2. Heat the oil in a large non-stick frying pan and cook the beef mince for 5-7 minutes, over a medium-high heat, stirring occasionally, until thoroughly cooked. Stir in half of the enchilada sauce with the chilli. 3. Spread half of the remaining enchilada sauce into the base of the dish. Divide the beef mixture between the tortillas and top each with 1 tablespoon of cheese. Wrap the tortillas tightly around the filling and place seam side down in the baking dish. Top with the remaining sauce and sprinkle with the remaining cheese. 4. Bake for 20-25 minutes or until hot and bubbly. Let stand 5 minutes before serving. Garnish with diced tomatoes, fresh coriander leaves, spring onions or diced avocado.